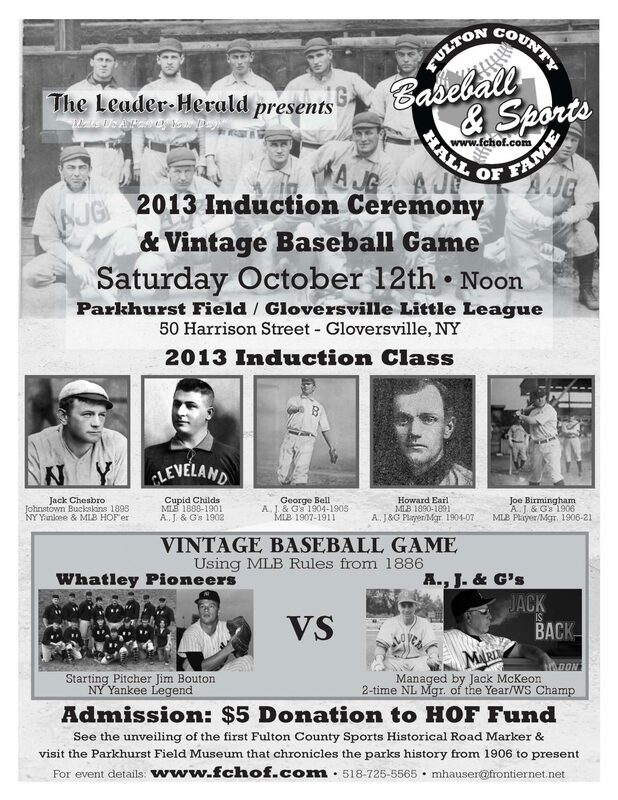 Gloversville, NY September 9, 2013 – The Fulton County Baseball & Sports Hall of Fame will be holding its 2013 Inductions on Saturday October 12, 2013 at Parkhurst Field in Gloversville NY between innings of a Vintage Baseball Game. The game will be played that day between the Whatley Pioneers of Western Massachusetts and the local A., J. & G Team, which is being compiled of former Gloversville Little Leaguers who once played at the historic Parkhurst Field site and have gone on to play professionally. 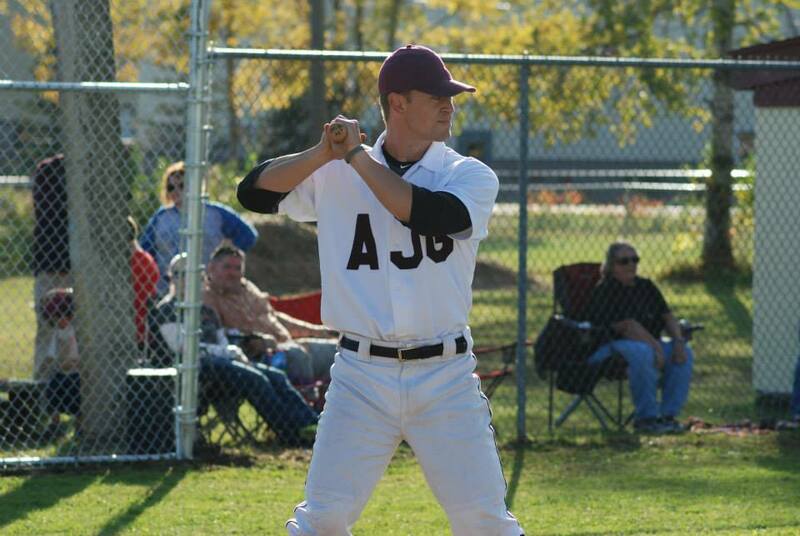 The starting Pitcher for the Whately Pioneers will be New York Yankee Legend Jim Bouton, while the Manager of the A., J. & G Team will be Major League Coaching Legend Jack McKeon. Set to be inducted will be players from the old New York State League Teams that played in Johnstown & Gloversville from 1895-1907. Inductees will include Jack Chesbro (Johnstown Buckskins 1895/NY Yankees/MLB HOF’er), Cupid Childs (MLB 1888-1901/A.,J&G’s 1902), George Bell (A.J.,G’s 1904-1905/MLB 1907-1911), Howard Earl (MLB 1890-1891/A.,J.&G’s 1904-1907) and Joe Birmingham (A.,J.&G’s 1906/MLB 1906-1921). “We are taking the concept a step further by creating a team that honors the A., J. & G teams and players who played on this site with former Gloversville Little League Players, who also began their baseball careers on the very same patch of land several decades later,” adds David Karpinski, President of Gloversville Little League and Co-Chairman of the event. “Both teams will be wearing throwback uniforms consistent with those worn by their respective teams at the turn of the century, while playing by MLB Rules in place at that time. Adding such modern day legends as Bouton and McKeon will add to the excitement of the day and provide a wonderful memory not only for the players participating in the actual game, but for the residents of Fulton County & Upstate NY who will have the opportunity to witness this historic event,” comments Hauser. This marks McKeon’s first managing job since he retired as the Miami Marlins Manager at the end of the 2011 Season. Prior to that, McKeon had guided the Florida Marlins to the 2003 World Series Championship over the NY Yankees. McKeon has been in the game of Baseball professionally for 64 years and has managed the Kansas City Royals (1973-75), Oakland A’s (1977-78), San Diego Padres (1988-90), Cincinnati Reds (1997-2000) and the Florida/Miami Marlins (2003-2005 & 2011). McKeon is the only manager in the history of Baseball to win over 1,000 games in both the Minor Leagues & the Major Leagues. Along the way, he earned Major League Baseball’s Manager of the Year Award in 1999 & 2003, while becoming the oldest person to win a World Series in 2003 at the age of 72 when he guided the Florida Marlins past the New York Yankees. Bouton, who authored the controversial book Ball Four, a tell all diary & memoir of his playing days as a MLB Player, will start the game for the Pioneers. Bouton’s Major League Career spanned from 1963 to 1978, with the NY Yankees, Seattle Pilots, Houston Astro’s and Atlanta Braves. He was a 1963 All-Star and a World Series Champion with the NY Yankees in 1962. His World Series Pitching Record is 2-1, with a 1.48 ERA. At the conclusion of the game, a roadside ceremony will take place in which representatives from the Fulton County Museum will be on hand to help unveil the very first Fulton County Sports Historical Society road marker that denotes that Baseball has been played at that site since 1906. The Parkhurst Field Museum chronicles the history of the facility since 1906 and will be open to the public that day. Admission to the game is a $5 donation to the groups HOF Fund. Gates open at Noon and the Vintage Game/Ceremonies will begin at 1pm. Parkhurst Field/Gloversville Little League is located at 50 Harrison Street in Gloversville.